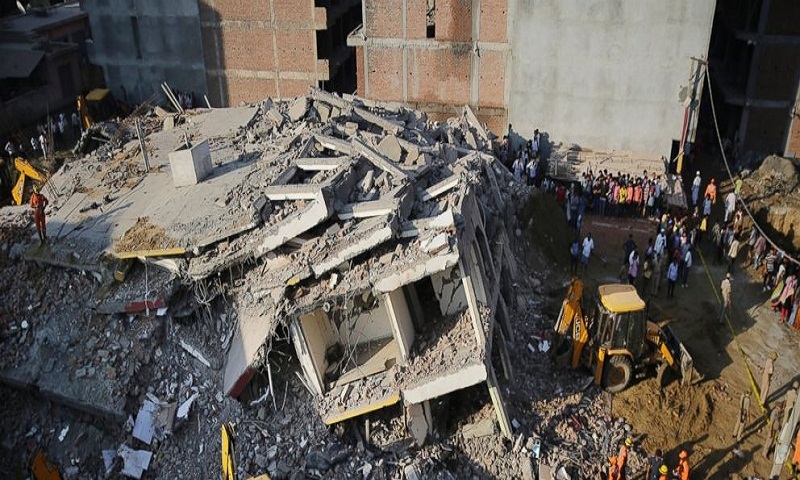 A six-story building under construction collapsed onto an adjacent building east of the Indian capital, killing at least three people and trapping several others under the debris, police said on Wednesday. Chief Fire Officer Arun Kumar Singh said at least 12 workers were in the building at the time and are feared trapped under rubble, the Press Trust of India news agency reported. The rescuers have so far found three bodies from the debris, police officer Ajay Pal Sharma said. The second building also collapsed under the impact of the first building that fell on Tuesday night, he said. The four-story building was 2 years old and only one family lived there, district magistrate B.N. Singh said. One security guard and some workers on the ground floor may have been inside at the time as well. More than 100 rescuers with cranes, sledgehammers and chain saws worked through the night to remove the debris in Shahberi village, nearly 40 kilometers (25 miles) east of New Delhi, said Krishan Kumar, a rescue agency official. Drills were being used to remove metal rods to reach those trapped. A dog squad was at the site smelling for signs of life. The owner of the building under construction and his two associates have been detained for questioning, Sharma said. The cause of the building collapse was not immediately known. The National Disaster Response Force, a federal rescue agency, was helping police in the search and rescue operations, Ravinder Singh, a NDRF official, said it would take several hours to clear the debris. Angry residents complained that the two buildings collapsed around 8:30 p.m. Tuesday (1500 GMT) but the police and fire services reached the site an hour and a half later. The rescue effort was slow to begin with, resident Praveen Srivastava told the New Delhi Television news channel. Another eyewitness said she felt the earth shaking as the buildings came crashing down. "The impact was such that I wondered whether the buildings have been dynamited," she told the Times Now television news channel. She didn't give her name. Rescuers found it difficult to take cranes and drilling machines to the site, where the ground was dug up in places during the construction work and had filled with water from monsoon rains. Television images showed a police officer dangling from a crane, trying to locate those trapped through the windows of the collapsed building. Building collapses are common in India during June-September monsoon season, when heavy rains weaken the foundations of structures that are poorly constructed. The worst collapse in recent decades killed at least 72 people in Mumbai in 2013.